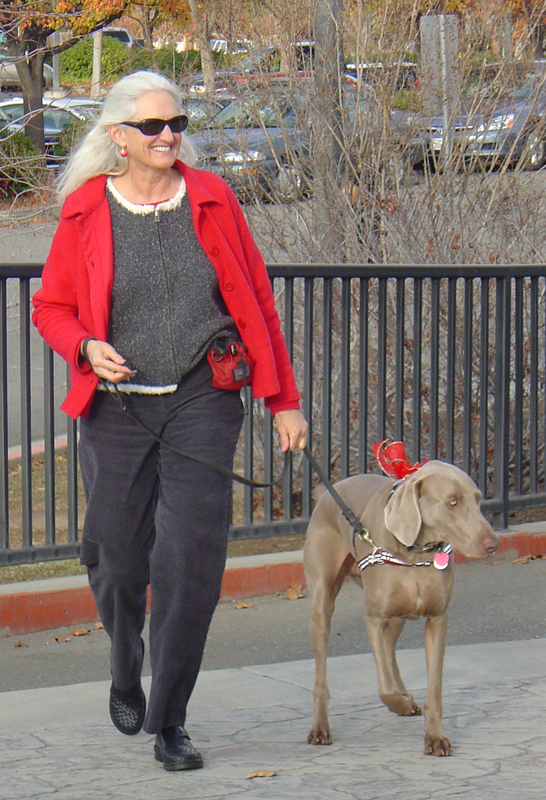 Jenny and Kobe, therapy dog "Pet Partners", on a Christmas visit to Windchime of Chico. There has been a dog in my life named Kobe Wan. I first met him several years ago when he came to one of my dog classes with his guardian, Jenny. Jenny and Kobe were an impressive sight – both tall, composed, and dignified in appearance and demeanor. They made for a striking pair. The teamwork between them was remarkable. Jenny taught Kobe an array of behaviors and he responded to her cues as if anything but utmost perfection was beneath him. Jenny and Kobe moved together as if they were seasoned dance partners and together they progressed through advanced training and became a certified therapy team. But beyond Kobe’s steady demeanor was a serious health problem and anxiety about being alone. Perhaps it was these characteristics that landed Kobe in an animal shelter before Jenny found him and made him hers – and she became his. She adopted him, provided him with the best of care, and set about to develop his mind, sooth his anxieties, and heal his body. To help with his anxiety, Kobe was enrolled in our day care program and over the months he flourished. Initially he would pace and fret about Jenny’s absence and the antics of other dogs. But over time he came to play with his canine friends, relax on our couch, and snooze at our feet while he waited for Jenny at the end of the day. We at the Canine Connection loved him. He was one of our family and we shared Jenny’s sense of privilege for his presence in our lives. Today we learned the unthinkable. This weekend, Kobe died. It hurts just to write these words. Kobe Wan was larger than life. His presence filled the room. His connection with Jenny seemed almost tangible. Their life together was woven of a common cloth and surrounded by a cloak of love. Our hearts hurt because we have lost our dear friend, Kobe. And they hurt even more because we know the grief Jenny feels. In this privilege of sharing our lives with dogs, so too is there pain. But there is comfort in knowing that our lives have been forever blessed by Kobe Wan and that his spirit will linger in our hearts forever more. This entry was posted in Uncategorized on November 8, 2010 by sarahrichardson. I have now read several things which you have written. The words you write speak so clearly of the love you have for the dogs in your life. Your words tug at my heart strings and bring a tear to my eye. I didn’t know Kobe nor Jenny yet I feel her pain. In loss, “knowing that our lives have been forever blessed” is the passage way through grief. Thank you, Sarah, for your sensitive and loving account of my love affair with my Kobe Wan. He was a deeply sensitive and demanding soul, in this short time with him, and I am most definately the better for having welcomed his troublesome self into my world. He was my “Special needs” fella, beyond anything you all knew relating to day care, I suspect, with health issues that exceeded anyone’s imagination. But what he gave back to everyone is intangible in it’s infinite magnitude, in the thousands of moments of sweetness, the look, the request, the tenderness that never ended. That fella is indelibly engraved in my heart and my soul, and I miss him as I’ve never missed a soul in my life. Goddess bless his journey, may he run free like a big dog in glorious green fields forever, with my love beside him always. I am so very sorry to learn of Kobe Wan’s passing. You and Kobe were special together. I am so glad I was in classes with you. I will always remember seeing you and Kobe on our walks at the Tree Farm, and romping in day care. I never knew Kobe was ill. Losing a special dog is so hard, especially when our time with them is short.